Making sure the Ice Team has enough food – and, critically, the right types of food – is one of the most essential aspects in planning this or any other polar expedition. As Brian Newham’s partner, and with much expedition experience of my own, it fell to me to coordinate the onerous task of selecting, ordering and preparing, all of the food ready for the off. The Coldest Journey’s Ice Team was originally made up of six hungry men who would potentially spend up to thirteen months on the ice, alone and with no chance of rescue or resupply. The success of their expedition would hinge on them being able to take everything – including their food – with them from the very beginning. This meant that every single meal – all 1,095 of them – had to be ready before the SA Agulhas set sail from London on 6th December, 2012. 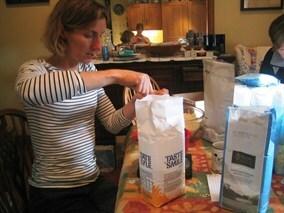 The first stage in the challenge was working out how many calories the team would need to eat per day on the ice and this varied between expedition members; Ran would need up to 7,500 calories per day when skiing whilst the Cat drivers in their warm cabs would maybe only need 3,000 calories on days when no outside work was required. It was also important to do our best to provide a balanced diet with the foods available. The other problem was finding foods that were suitable to be kept outside and would be able to withstand being frozen to temperatures of -80C whilst for the first month of the expedition they would be not frozen at all; a lot of food packaging, such as glass bottles or jars and tins with a high water content, will explode when frozen. Bearing in mind that most of the food will have to be stored outside of the living caboose, this was a key issue and food had to be selected that was suitable. A small amount of tinned and other types of packaged foods would be kept in the warmth of the caboose, but storage in there is very limited. It was clear straight away that the vast majority of the food taken would be dried food, like pasta, rice, dried potato and freeze dried beef and chicken, which is not only very light but has next to no water content and will therefore be less affected by the cold. With this in mind it was crucial for us to work out the best ways of ensuring the team got enough calories but also the correct balance in terms of nutrition and, just as importantly, as much variety as possible. There are going to be many hard times on this expedition and a meal that tastes and looks good can lift spirits and morale. I called the expertise of Dr Mike Stroud who was able to provide excellent advice on nutrition and subsistence foods from the point of view of a world-renowned polar explorer and respected medical practitioner. This gave me a good insight into what would be needed for the trip, together with additional advice from Dr Barbara Engel who is a nutritionist and colleague of Dr Mike Stroud. Glaxo Smith Kline also provided a lot of nutritional advice as well as supplying a variety of sports nutrition bars for the expedition. With all this information to hand I was able to formulate a list of the most suitable foods and start to draw up a daily food plan. With a clear understanding of what we needed, it was then a case of getting everything shipped in from our most generous food sponsors Waitrose, Glaxo Smith Kline and expedition food specialists Be Well. The sheer scale of this operation could only be fully appreciated once the deliveries started rolling in. Brian and I live in a remote hamlet amongst a farming community in Cumbria, and we had agreed to do all of the food preparations from our home. 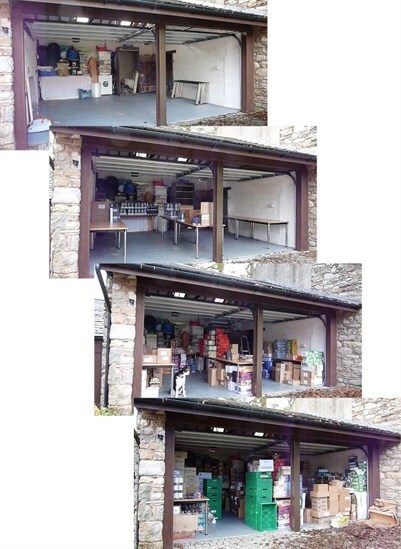 We thought our double garage and barn would provide enough space but once all the food with all of its packaging, plus the boxes, the weighing machines and sorting tables were taken into account, the garage was chock-a-block and the excess was starting to quickly take over the house. The meal plan consisted of 14 different main meals, 7 different puddings and a variety of snacks (chocolate, biscuits, nuts, dried fruit) and a variety of hot and cold drinks (tea, coffee, chocolate Horlicks, Be Well energy fruit drinks). With no shortage of ice and snow, running out of water should not be a problem as long as they keep shovelling it into the melt tank. 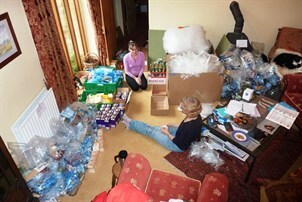 The next stage involved the meticulous task of unpacking the delivered food, weighing it out and then repackaging it in “Day Packs” for each member of the team. Thankfully I had a truly wonderful army of friends who worked tirelessly with me, weighing each portion to the nearest gram so that all meals would be the same size exactly (the skiers would get most of their supplementary intake in the form of snacks) – no more, no less. Ranulph Fiennes famously recalls how he used to get infuriated with Dr Mike Stroud for taking more than his fair share of the food during their expeditions together. But when Mike would suggest swapping their food, Ran still believed he was being short-changed. Of course, he was not, and they were getting exactly the same; nut when you are that tired and hungry then it starts playing tricks with your mind. Being this meticulous was no mean feat and it took me and my team of friends weeks just to get the portions ready and a further four weeks bagging them up. Once the meals had all been weighed and put into portions they were put into plastic bags, and where necessary vacuum-packed using a heat sealer. They were then put into the member’s day bags and then the collective day bag, before being sealed up in the aluminium Zarges containers. 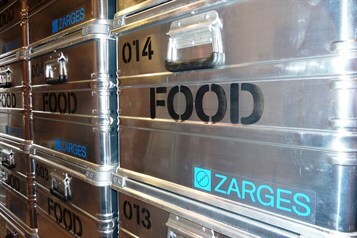 Being lightweight and extremely strong, these truck-like boxes are big enough to hold nine days’ worth of meals for the team, are stackable and easy to move around, making them ideal for the requirements of the expedition, to myself and the rest of the helpers who wanted to store the product of all our hard work somewhere safe and secure! The team is taking food for thirteen months which should be more than enough. However, there is always the risk of something falling down a crevasse and being lost forever. So, to mitigate that risk as much as possible, the food will be distributed around the different storage areas of the convoy. If something gets lost, hopefully they will have enough to see them through. I know Brian has been looking forward to the food side of things for some time, having seen it prepared before his very eyes. I think one of the highlights for the team will be the loaf of fresh bread they will have waiting for them every morning. They have a breadmaker and enough supplies for a loaf a day for a whole year: let’s just hope it does not pack up half way through the challenge. We have also packed in some special meals for them along the way for important occasions, but I don’t want to ruin any surprises so I won’t say any more than that. I am sure the guys will tell you about them on the website as they have them.